I am German. My Mom learned from her aunt how to make potato salad. No recipe was written, but when I got one from the Germanfest I attended in Roberts Cove, LA and showed it to my Mom. She said, "That's it, that's the recipe my aunt used." 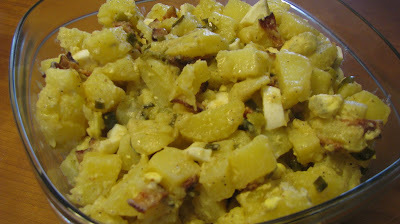 My Mom doesn't make this potato salad (she has her own recipe, which I will share later) but I do. Here it is! Thanks, Germanfest! I cut green onions with kitchen shears. I think it is easier than chopping them. Apple cider vinegar is not necessary, but only use light colored vinegars. Darker vinegars (like a balsamic) change the color of the potatoes and eggs and then it looks bad.